The retreat of sea ice in the Arctic Ocean has been one of the most dramatic recent changes in earth’s climate system. It poses a direct threat to indigenous Arctic cultures but at the same time, it is setting off a reimagining of global commerce as once-blocked Arctic shipping lanes become navigable. A comparison of computer climate models shows, however, that there is no consensus on how much of this melt is being caused by global warming. And though the retreat of Arctic sea ice matches neatly with the global warming trend observed over the past 30 years, sea ice extent in the Southern Hemisphere has actually increased slightly in that same time period. Puzzles like these have led Ian Eisenman, one of the newest faculty members at Scripps Institution of Oceanography, UC San Diego, on a quest to better understand the physical processes that drive large-scale sea ice changes. In February, Eisenman joined Scripps as an assistant professor and the inaugural holder of the Jerome Namias Chair, having already begun to consider the core questions of this relatively young field of climate science. Before coming to Scripps, Eisenman worked as a postdoctoral researcher since 2008 with a joint appointment at Caltech and the University of Washington. During this time, he developed theories about how sea ice interacts with the oceans and atmosphere, the major components of the climate system. He analyzed the physical processes that occur in computer climate models, which are a main tool of climate researchers who seek to accurately replicate and forecast climate phenomena. Eisenman concluded that two factors — the shape of coastlines and the winds that bring heat from the equator toward the poles — are the most crucial factors for accurately representing the seasonal retreat and advance of sea ice in both hemispheres. “These results provide a context for interpreting observed sea ice changes, and they provide a framework for evaluating the widely differing future sea ice projections from current climate models,” Eisenman said. Eisenman received a bachelor’s degree in philosophy and physics from Williams College in Williamstown, Mass., in 1999, a master’s in physics from UC Santa Barbara in 2002, a master’s in applied mathematics from Harvard University in 2005, and a Ph.D. in Earth and planetary sciences from Harvard University in 2008. Current questions he is considering include how sea ice responds to climate changes and whether sea ice retreat can be irreversible. In addition to sea ice research, Eisenman also works in other areas of climate dynamics including using models to understand climate changes in the distant past. 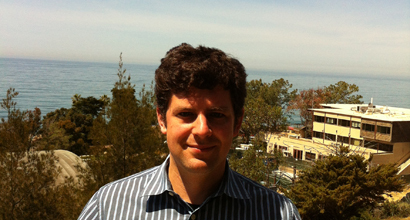 In his research, Eisenman uses a variety of models ranging from idealized mathematical representations of climate phenomena that can be solved with pencil and paper to comprehensive climate models that are run on massive supercomputers. His research also draws on satellite observations.